We had sangrita this past weekend and of course with my beefy arms I broke our lemon squeezer so we resorted to the automatic citrus juicer. I really like the addition of pomegranate juice. It gave the sangrita the correct coloring. Stayed to our basic recipe of 1 Grapefruit, 3 orange, 1 lemon and 5 lime juice with a drop of worschester, tiny amount of garlic and ginger, red chile 1/2 teaspoon and pomegranate juice 2 oz of course we also bought a new tequila Jose Cuervo 100% agave my favorite is still cazadores but that can still change. No rainstorm but it was cloudy. I just checked onto your site to see if you had any comments on the last tequila tasting and how we won at baseball. 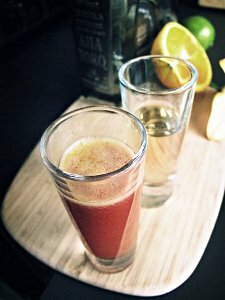 I thought you might have pictures and other info on the the sangrita. We have not made any sangrita but we have had tequila without it but I like tequila better with the sangrita.